Presenting how to make room shoes out of a newspaper! “Girl Spies ☆ Ishino Maki” tells the story of a group of ordinary girls becoming spies to rescue Ishinomaki from evil. “Ishino Maki” fight the baddies ‘Waruda Kumi’ and their sinister ploys, but upon finishing their mission they lose their memory, forgetting that they risked their lives to protect the town and keep the peace. Up till now, the story of “Girl Spies ☆ Ishino Maki” was presented as a picture storytelling during Tsuru no Yu Festival (April 28, 2013 @ Oshima Shrine) and Ishinomaki Mega Festival (August 11, 2013 @ Nakaze City). 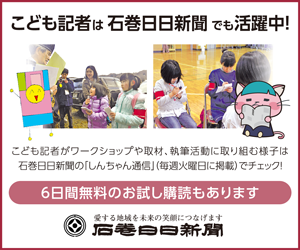 A stage version was performed for the first time in Ishinomaki Child Centre on March 1, 2014.The stage version conveys knowledge about disaster prevention and safety tips in an approachable, child-friendly way and from the child’s perspective. This time’s “Newspaper Edition” featured everything to do with a newspaper. Entwined into the actual performance were interesting facts that it could warm you up if you wrap it around your stomach, or that you can make slippers by folding it. There are more performances of “Girl Spies ☆ Ishino Maki” plays with a variety of themes to come, and I can’t recommend them enough. The ‘Ishino Maki’ rescue not only their town from evil, but perhaps also Japan and the world as well. What kind of battles await the girls? 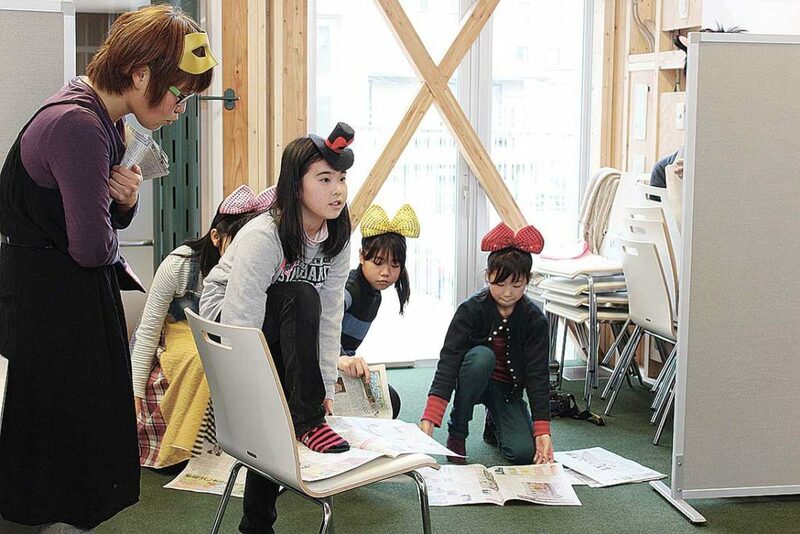 I know for myself that I want to cheer the “Girl Spies　☆ Ishino Maki”on.